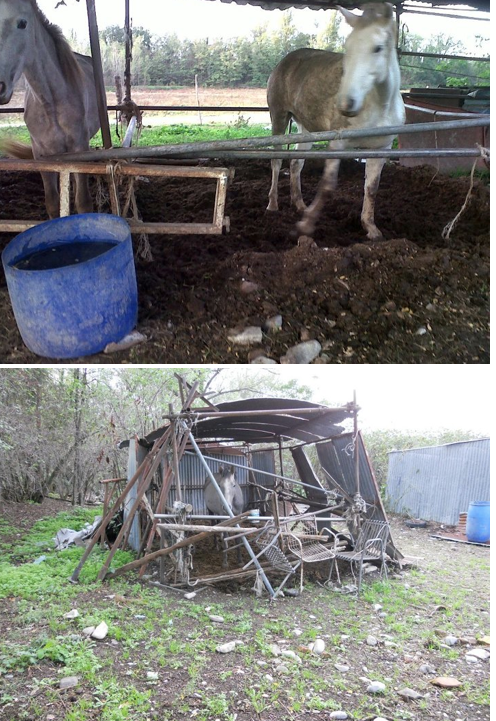 Home » Association News » Problems facing Italy – laws failing horses yet again. Problems facing Italy – laws failing horses yet again. This is the link from the Italian Horse Protection Facebook page. https://www.facebook.com/notes/ihp-italian-horse-protection-association/parma-cavalli-tenuti-in-pessime-condizioni-intervento-di-ihp-e-striscia-la-notiz/530579993636934 – the rough translation is below. It has to be the classic situation where ignorance in the end becomes ill treatment: there is no other explanation as to why a 70+ man would have 32 horses (possibly there are even more) most of which are kept in completely unacceptable conditions, chained up or loose in dangerously ill-maintained paddocks. Stallions and mares continually breeding, thin horses, hooves showing clear signs of laminitis. Many of these horses also without water or food available. And all of them, absolutely all of them with passports showing they are destined for the food chain, in other words to be sent to slaughter for meat. Yet another sign that the local authorities (the ASL) is fully aware of this crazy situation, which people have been reporting in vain for many years. With no stop whatsoever put to this unchecked breeding farm. Because in Italy this is how it is, with horses: anyone can invent themselves as a breeder, without the slightest heed to the laws and regulations and with no respect for the welfare of the animals. There is even a missing filly, to date there is no news of her: she was three months old when, on 4 October, her skeleton of a mother was euthanized because she had been unable to get to her feet for three days due to chronic laminitis. At that point the filly was handed over to ‘someone’. The Italian Horse Protection, following up numerous reports, organised a first visit on 12 October, and immediately thereafter sent a detailed report to the Ministry of Health, together with videos and photos. In spite of the animal welfare task force going immediately into action by notifying the police, no response was received. The IHP Italian Horse Protection association are currently consulting with their legal advisers on the best way to proceed, which course of legal action to take, including filing action of the most serious kind, in order to act on behalf of these horses.